New File Notifications let you notify everyone in the data room whenever new files are added by either the data room owner, co-owner, or contributor. Only the Team/Enterprise data room owners can enable this feature upon creating a data room or changing the data room settings. Select Off if you do not want any email notifications to be sent out whenever new files are uploaded to your data room. Select Ask if you want the system to prompt the person (owner/co-owner/contributor) uploading new files if an email notification is necessary. Select On if you want the system to automatically send email notifications each time new files are uploaded to your data room. 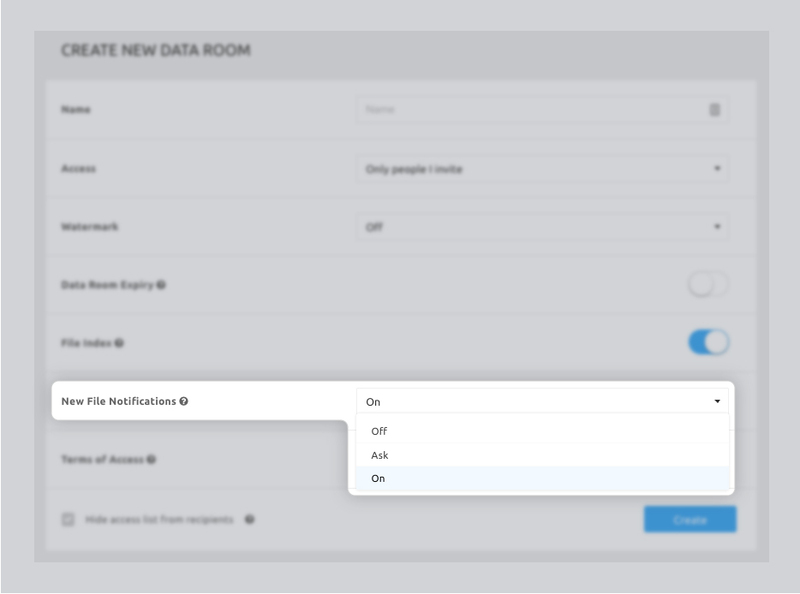 Data room users have an option to mute or unmute new file notifications for specific data rooms. Go to the specific data room. Click Mute Notifications or Unmute Notifications.